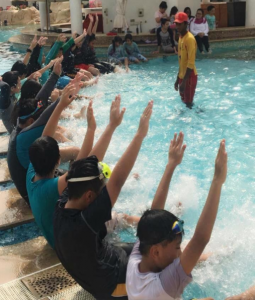 The Philippine International School – Qatar in coordination with Sharq Village and SPA through the kind effort of their recreation Manager, Mr. Asela Jayaweera, offered water safety awareness training to Intermediate pupils. Pupils specifically with 6 to 12 years of age were given a chance to have training on water safety. The said program aims to raise awareness about water safety and the appropriate steps that the children need to undertake in case of emergency in water. This program is designed according to the standard of Australian lifesaving Federation and Sri Lankan Lifesaving Federation. The training was held every Saturday from July 15 to August 19 at 7:30 A.M. to 10:30 A.M. at Sharq Village and Spa, Ritz Carlton Hotel. Thirty students per grade level were given an opportunity to be taught about Water Safety Awareness and Preparedness; Everyday Lifesaver; Survival Strategy; Rescue Strategy and Safe Body Boarding. All attendees were not just educated about water safety but they also had fun in the water.